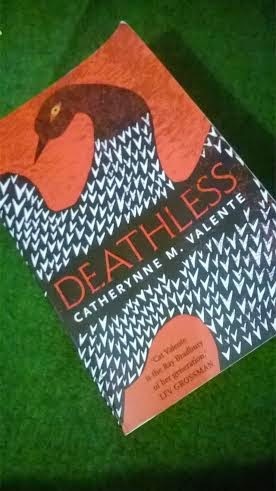 Catherynne M Valente is a lesser known author that has been receiving a lot of attention lately and I'm always on the look out for discovering new favourite authors. For some reason I thought Catherynne M Valente would be an older woman of about sixty due to her impressive array of published fiction but when I checked out her website I was shocked to see how young she was. Alongside her novels she has published various works of poetry and her short stories have been published in the likes of Lamplight Magazine which are featured on the Magazines page, if you're interested in submitting work to them. I chose Deathless as it sounds unusual, this is an author who knows how to think up great and enticing book titles. Deathless mixes Russian folklore with dark magic set against a backdrop of Russia in the early 20th century. On first impressions it reads like a slightly macabre fairy tale. It retains a child like tone but is for adults. The prose is poetic and beautiful, it comes as no surprise from reading this that she is also an accomplished poet. The story centres around Marya Morevna. She reminds me of Alice Lidell, from Alice in Wonderland who blindly chases the white rabbit, or in this case, Kochei down the rabbit hole. She is no ordinary girl, she wants to see the world naked. She has caught a glimpse of what lies beneath the normal everyday world and wants to understand magic and the mysteries of life. She will do whatever it takes to possess this arcane knowledge. Marya thinks she is living in a blessed fairytale where she is the beautiful princess but soon realises she has been plunged into a savage nightmare. At some points it seemed rambling but I really respect the author to have the courage to really stand out and write something that is utterly unique. This books feels like it is inventing a new genre and so in places it comes across as a bit experimental. But it's so different that you can't help but continue reading. The world in which Marya finds herself in her own repeating fairytale and must struggle to break the pattern lest she meet a grisly end. The character of Marya hardens to suit her noew world and casts off her girl hood to become a wolf like creature. She learns magic, sees the naked world, yet still she wants more. She wants to have all that Koschei can give, she wants him to make her deathless. She has become as savage as her Koschei and yearns to be his equal rather than his posession. Koschei's relationship is intruging it is no normal love affair. Their relationship is built upon power struggles, lust and dominion. There's no sentimentality here which is a refreshing change. I found this a really riveting read, for me it was a hard book to review as it's just so different to anything I've ever read before. It's a very complex book that is very hard to summarise in a few paragraphs and I think the less I say about it the better it will be for those who haven't read it. How is the theme of war expressed in this book? How does Ivan contrast to Koschei? How does the communist movement affect the story and characters? Would it have been different if set in a capitalist world?